Identifying toxic contaminants in San Francisco Bay is the first step to getting them cleaned up. So when regulators tried to weaken testing for contaminated sediment in the Bay, San Francisco Baykeeper pushed back—and we succeeded. The contaminants in Bay sediment include pesticides, mercury, and the legacy industrial chemical PCBs. Since 2001, Baykeeper has been persistently advocating for regulators to do a better job of identifying and curbing toxic contaminated sediment in the Bay. Most recently, Baykeeper opposed a proposal to weaken assessments of contaminants in Bay sediment. Baykeeper urged regulators to adopt a more scientifically rigorous approach—and the State Water Resources Control Board listened. Last week, the agency adopted the rigorous sediment quality objectives that Baykeeper had advocated for. This means that contaminated areas around the Bay will be monitored for PCBs, mercury, and other toxins and cleaned up over time. 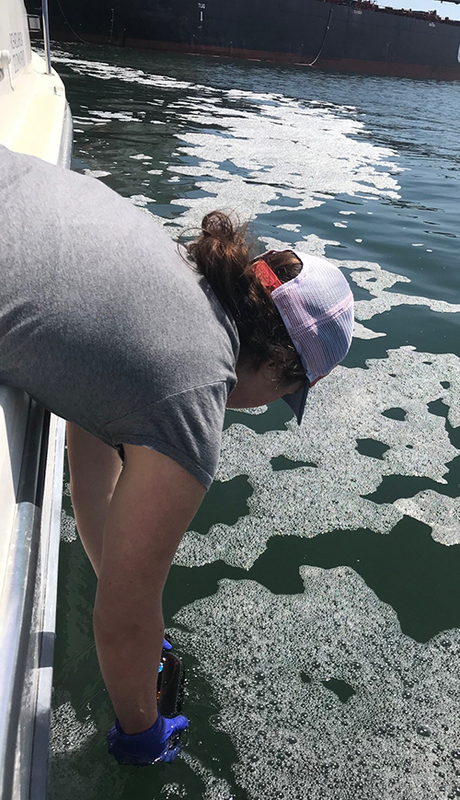 As Baykeeper Staff Scientist Ian Wren points out, "Rigorous data is critical if we're ever going to be able to address the decades-old problem of contaminant hot spots in the Bay." Read more about Baykeeper’s work to rid the Bay of toxic sediment. Clean water activists from across the nation and around the world shared success stories and grappled with challenges at the recent Waterkeeper Alliance Conference—including a team of staff from San Francisco Baykeeper. Baykeeper is a founding member of Waterkeeper Alliance, the 340 organizations that make up the world’s fastest growing movement for clean water. From Lake Erie in the US to the Yellow River of China, Waterkeepers across the globe face a host of similar challenges. In addition to discussing big issues like climate change and sea level rise, we shared concerns and ideas about plastic pollution, including troubling trends related to microplastics accumulating in rivers, estuaries, oceans, and even snowpack. A big thank you to United Airlines for sponsoring Baykeeper's airline travel to this year's conference! United's support allowed us to send six of our staff members to Buffalo, New York. We were also grateful to be able to share 10 of our United Airlines travel vouchers with sister Waterkeepers in Costa Rica, the Bahamas, Belize, the Dominican Republic, El Salvador, Guatemala, Mexico, and Panama, which enabled them to bring representatives to the conference, too. That's a big boost for global clean water collaboration! Now the Baykeeper team is back home, energized by all we learned, and inspired to fight even harder for the health of San Francisco Bay. 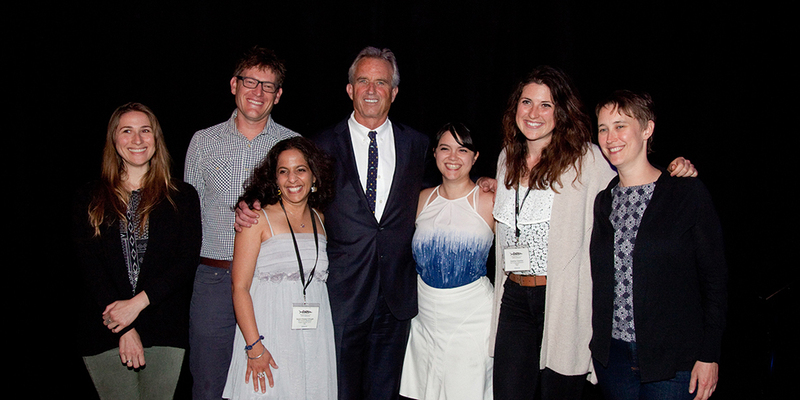 Pictured above, the San Francisco Baykeeper team with Waterkeeper Alliance President Robert F. Kennedy, Jr. (center) at the Waterkeeper conference. Photo by John Wathen. In a big victory for San Francisco Bay, a private luxury marina proposed for development in Clipper Cove at Treasure Island will be drastically scaled back. These efforts recently led to a decisive vote by the San Francisco Board of Supervisors to reject the large marina in favor of a much scaled-down version. The Supervisors' action will help protect underwater habitat in Clipper Cove. The cove, a small inlet of San Francisco Bay between Treasure Island and Yerba Buena Island, is home to native eelgrass beds. The eelgrass provides shelter for young fish and shellfish, food for migratory birds, and a buffer that helps prevent coastal erosion. The scaled-back marina design will also allow the Treasure Island Sailing Center to remain open at Clipper Cove, which would have been impossible with the larger marina. The center allows thousands of youth to access sailing opportunities, including a sailing program that serves over 1,500 San Francisco elementary schoolers each year. Learn more about Baykeeper's victory for wildlife and public access to the Bay on Treasure Island. 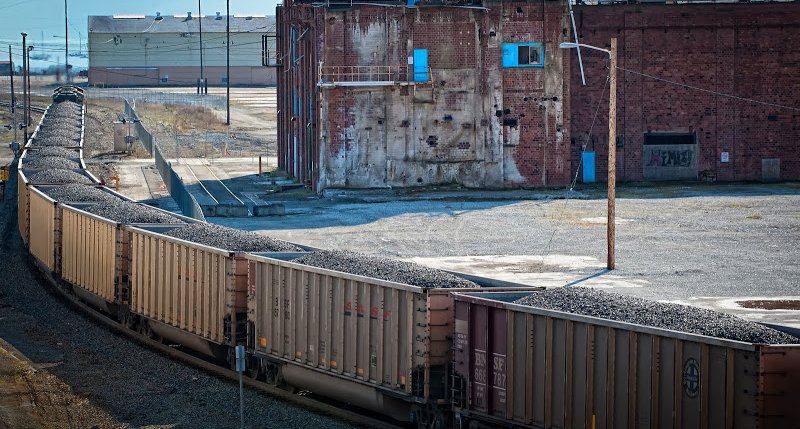 In response to Baykeeper's legal action, Containers Unlimited has agreed to stop pollution of San Francisco Bay from its Oakland plastics recycling facility. The facility has been releasing runoff contaminated with high levels of heavy metals and other pollutants into storm drains that empty into San Leandro Creek, which drains to San Francisco Bay. Large quantities of exposed plastic containers around the facility, pictured above on the left, were likely a source of some of the contamination. Rain fell on these containers, picked up pollution, then ran off the site and eventually to the Bay. Containers Unlimited has already made major improvements by clearing the uncovered plastic containers from the facility grounds, pictured above on the right. Their legally-binding agreement with Baykeeper will also require the company to construct a retention pond to hold contaminated runoff and install a biological filtration system, and make further improvements if these measures don’t adequately reduce the pollution from the site. This is the 44th victory in Baykeeper's Bay-Safe Industry Campaign to stop illegal runoff pollution that flows into San Francisco Bay from industrial facilities. Learn more about Baykeeper's legally-binding agreement requiring Containers Unlimited to stop polluting San Francisco Bay. Calling all oyster lovers! 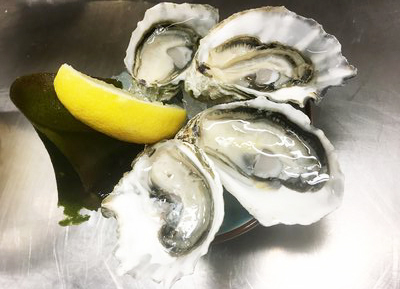 There's still time to savor some briny treats and, at the same time, support San Francisco Baykeeper's work to protect the Bay. Through the end of June, Waterbar restaurant in San Francisco is donating 5 cents to Baykeeper for every oyster sold. Waterbar specializes in sustainable shellfish and seafood, and we're excited to partner with them on the Waterbar Oyster Giveback Campaign. The restaurant is located on the San Francisco Embarcadero, with great views of the water—a fitting place to eat oysters for a healthy Bay. Learn more about Waterbar's Oyster Giveback Campaign supporting Baykeeper. Baykeeper's 5th annual Bay Parade is just a month away. And you're invited to the celebration of a healthy San Francisco Bay. You can stand up paddle, kayak, swim, boat—or just party! Stand up paddle or kayak: 2.5 miles from Pier 40 to the Bay Bridge to McCovey Cove. Swim: 6.5 miles from the Golden Gate Bridge to McCovey Cove, solo or in a relay team. Volunteer support boats now available. 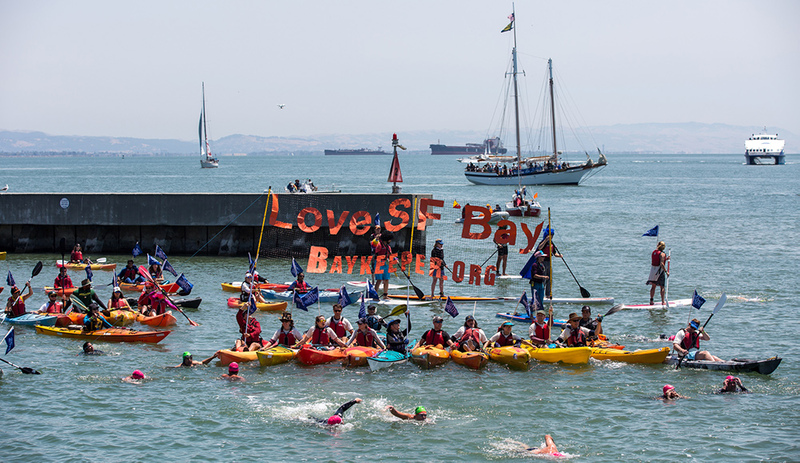 Boat: Volunteer sailboats, motorboats, and rowboats needed to support swimmers from the Golden Gate Bridge to McCovey Cove. Party: Join Baykeeper and Bay Paraders at the Bay Parade After Party, with tasty bites and bottomless beer from Anchor Brewing. Come if you're part of the Parade—or come if you’d rather just party for a healthy Bay. Tickets are $50. To find out more on how to join the fun, and register, visit baykeeper.org/bayparade. See you on the Bay on July 15! Baykeeper was out on boat patrol in central San Francisco Bay when we encountered some suspicious foam being discharged from a large tanker ship. Shown here, at right, is Baykeeper Field Investigator Sienna Courter taking water samples. We sent them to a lab for chemical testing. Baykeeper will continue to monitor discharges and other potential pollution from large vessels in the Bay. 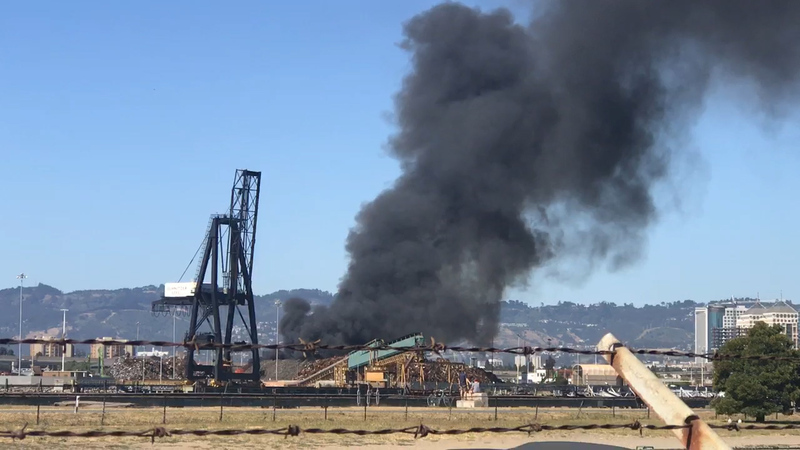 A major fire broke out on Saturday, June 2nd at Schnitzer Steel, an auto and metal recycling facility on the shoreline of the Bay in the Oakland-Alameda Estuary. A huge plume of black smoke was visible from miles away. Baykeeper was immediately concerned that toxic ash or smoke particles were falling into the Bay, or that runoff from firefighting could be washing pollution into the Bay. Baykeeper Field Investigator Sienna Courter and volunteer skipper Jeff Wasserman both patrolled the Alameda shoreline to investigate. Fortunately, Sienna and Jeff observed no visible Bay pollution from the fire. But Baykeeper has been monitoring pollution issues at Schnitzer Steel for many years, and we will continue to investigate to ensure the best possible protections for the Bay.